Adieu Flying Inkpot: What Now? And just like that, one of our cultural institutions in its own right has decided to call it a day. The theatre and dance arm of The Flying Inkpot has been consistently reviewing and assessing a large section of the arts scene for the past 19 years. In its own quiet way, it amassed a decent following and stands as an alternative source to our newspaper critics and a whole crop of glossy lifestyle websites of more recent vintage. The most unfortunate thing is that only those invested in the arts scene will understand the gravity of this loss. While Corrie Tan (The Straits Times, Life! ), Mayo Martin (Today), and Helmi Yusof (Business Times) will undoubtedly continue their wonderful work, their professional commitments mean that they will not be at the forefront of theatre criticism. One must understand that they are journalist-critics—journalists first, critics second. The focus of the newspapers probably require them to prioritise industry stories over the reviews. To compound the problem, they have to shoulder the lion’s share of the arts beat as they have few colleagues working with them. As such, their role in criticism is limited to being active writers and providing occasional feedback during industry consultations conducted by the National Arts Council (NAC). They neither have the time nor energy to promote the standing of critics, spark thoughtful discussions about the arts scene (beyond the allotted column inches), and improve the quality of writing (apart from their own). That is where The Flying Inkpot comes in and its departure has left a gaping hole in the eco-system. I have been reading Inkpot‘s reviews on and off for years. It started out as getting a second opinion on whether a particular show is good or not. However, having developed a strong interest in theatre criticism over the past two years (hence this blog), The Flying Inkpot has become a benchmark for me. My reviews have to be as good, if not better than what Inkpot puts out. Additionally, it has been an interesting experience to see if the writers there agree with my opinions of a particular show that I have reviewed. Behind the computer screen, I have occasionally let out exclamations of, “Hear! Hear! What’s with all the hype by people on Facebook?” or “Are you serious!? Did you even watch the show?” Indeed, I feel an odd sense of camaraderie just by yelling at my computer screen after reading the reviews. As the performing arts scene show gratitude for services rendered, a pressing question looms: What is next for theatre criticism? Here are some initial ideas. For starters, before we decide our next step, we have to lay the groundwork for current and future critics. In acknowledging the value of the reviews for researchers, practitioners, and aficionados, the editors of Inkpot—Kenneth Kwok and Matthew Lyon—have decided to make the archive available to all even after the website has shut down. The mainstream media should do the same. Rather than subject interested individuals to squinting as they scroll through microfilms or settle for heavily watermarked copies online, the NAC should partner with Singapore Press Holdings (SPH) and Esplanade Library to start an online portal which contain all the reviews by our newspaper critics past and present. NAC should also commission a book which will be a general survey of the history of theatre criticism in Singapore. Drawing from the newspapers and The Flying Inkpot, it will feature some key reviews of various productions over the years. Perhaps it can include an introduction at the start of each section which analyses writing styles of reviewers or interesting insights about theatre history that can be gleaned from these reviews. If there is enough academic and artistic interest, an academic book can be published which contains various essays about theatre criticism. They can range from in-depth analyses of particular critics to how theatre criticism fits in our local arts eco-system. Practitioners could contribute essays about their views on critics or how they made use of past reviews to inform their research while creating a new production. In the best of all possible worlds, we should work towards having full-fledged critics or at least actor/dancer-critics (some feel that there will be a conflict of interest but I disagree—another post for another day) a reality. Criticism is not just about watching something and voicing one’s opinion. A critic should be as knowledgeable about the performing arts as possible. Ideally, he or she should be reading up on latest trends and research in the day before rushing off to review a show at night. It is a proper career and not something you do when you have some time to spare in the evenings. However, even if all relevant parties were to work together on this (and that is a big if), it would take at least 10–15 years to achieve this. What can we do now? Well, a critic is nothing without readers. Apart from The Art of Review talk organised by the Esplanade Library this year, there was no forum on theatre criticism in recent memory at all. I would like to see discussions comprising both practitioners and critics on the same panel and get views from both sides of the curtain. A public talk will give the audience a chance to weigh in on what they think the role of criticism. It would also benefit the critics as, speaking from my own experience, they hardly get any feedback from their readers and the conversation borders on being insular. Of course, one might point out that it is a lovely exercise of preaching to the choir. This might be true in some respects but a realistic goal of such public outreach is to encourage those who might be willing to engage at a deeper level rather than “convert” the uninterested. Besides, even within the arts scene—and I will be really pleased if I am wrong—the engagement seems to be between the reviewer and the reviewed; the choir needs some encouragement to expand its repertoire and sing louder. As for more “concrete” measures, the easiest route to take is to ask all the writers to start their own blogs or, for those who are interested in journalism as well, join The Muse (a rather good arts website). Alternatively, they could join the glossy lifestyle websites and improve the quality of criticism there (I shall not bore you with a list of their inadequacies). While that is all well and good, a central website is still necessary. If everyone does their own thing, who does a theatre company choose to offer press tickets to? Will they shun critics whose tastes and proclivities do not incline towards the genre or dramaturgy that the company is known for? We cannot all flood The Muse and there is something to Inkpot resolutely standing as an alternative—not necessarily against—to the soundbites galore offered by glossy websites that seem to be spawning exponentially. 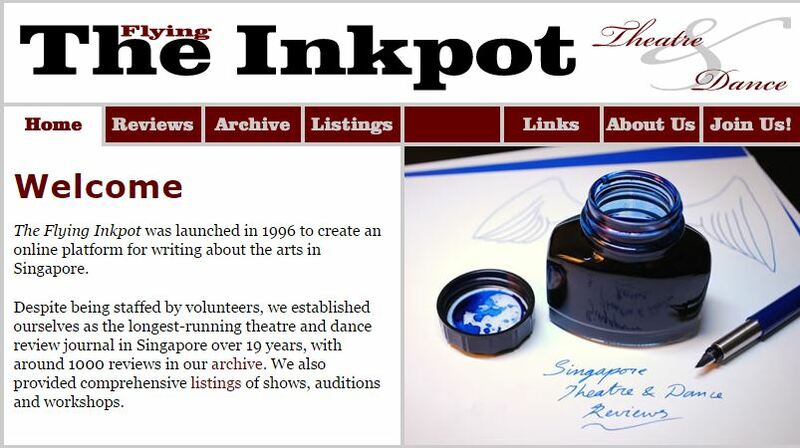 Matthew Lyon is on to something when he mentioned that if Inkpot were to be revived in any way, shape, or form, it will have to expand its scope to include videos, podcasts, and feature articles. However, it would take a generous funding model to sustain this. On top of that, it would require a full-time team which would not be possible for him and fellow editor, Kenneth Kwok, to be in charge of. He does not think corporate sponsorship or advertising might be a good idea as the site should not be beholden to commercial interests and that most companies do not want to be associated with an activity that is generally (and most erroneously) seen as being nasty to people. I sympathise and somewhat agree with Lyon. But there are a lot of things going on here. In the beginning, this website will still have to be on a voluntary basis for a while but it can steadily progress to a model in which contributors are paid a nominal fee. While it might probably be true that big corporate sponsors do not want to be associated with the website due to the negative perceptions of what critics do, it might not be true for smaller establishments. Perhaps one should woo restaurants and bars that are near performing venues for advertisements. Why would it matter to them if it is a eulogistic or slamming review as long as the readers—who form a reasonable section of the theatre-going public—glance at their advertisements and learn about their promotions? The only clash of interests here are companies who serve as official caterers or are involved with certain promotional tie-ups with a particular theatre company. Even with them off the list, there are still many companies available. Aside from that, why do we have to limit ourselves to direct funding/ advertising/ sponsorship? Online advertising revenue has progressed quite a bit. There are “indirect” advertising revenue streams such as Google Adsense in which the website can earn some revenue based on the number of unique views or clicks on the advertisements displayed. If the website starts a YouTube channel, the videos can also be monetised. Hopefully, after a few years, the revenues will be substantial enough to remunerate the contributors. Speaking of YouTube, the sky is the limit in terms of content. It could be a panel talk-show setting (see Theatre Talk) in which various critics (including those from the newspapers) come together and talk about the shows they have seen, predictions for the Life! Theatre Awards, or just argue with each other over what they have written. It could also be two enthusiastic presenters just bantering away and occasionally inviting artists in for a chat. The setting of the latter format could be in a cafe and perhaps the management could give some advertising dollars too. Finally, there is absolutely no shame in asking people for donations. In fact, theatre companies could sponsor a couple of tickets and donors who donate a certain amount will be entered into a lucky draw to win them. Whatever it is, considered and insightful criticism must be kept alive and we are poorer for it if it dies. Adieu Inkpot, it has been a good run and—fingers crossed—we will meet again someday.